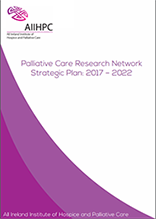 In 2012, AIIHPC established the Palliative Care Research Network (PCRN) to address the need for more collaborative multidisciplinary research in palliative care on the island of Ireland. This network was the first of its kind for palliative care in Ireland. The PCRN aims to offer the all-island palliative care research community opportunities to create and engage within a collaborative environment, supporting the development of excellent, high quality, clinically-relevant and innovative research projects that reflect, inform and contribute to the advancement of AIIHPC’s work programmes. The Annual PCRN Symposium allows members opportunities to learn from global experts, share knowledge and network. Also, PCRN members provide mentoring and support to the Early Career Researcher Forum, a supportive network for early stage researchers in palliative care. If you are a leading researcher from one of our partner organisations with a focus or interest in palliative care research please apply to be considered eligible to become a member of the PCRN. Pathways toward Social Justice: Understanding Equality and Inclusion in Palliative Care (Research strand one): is based on the premise that inequality exists in relation to palliative and hospice care access and service delivery across the island of Ireland for people with serious mental illness, intellectual disability, children with non-malignant life-limiting conditions and advanced heart failure. Watch this short video summarising this body of research by the lead principal investigator Professor Philip Larkin, Associate Professor of Clinical Nursing (Palliative Care), School of Nursing, Midwifery and Health Systems, College of Health Sciences, University College Dublin. An Exploration of Access, Decision Making and Experiences of Palliative Care Services for Families of Children with a Non-Malignant Life-Limiting Condition. 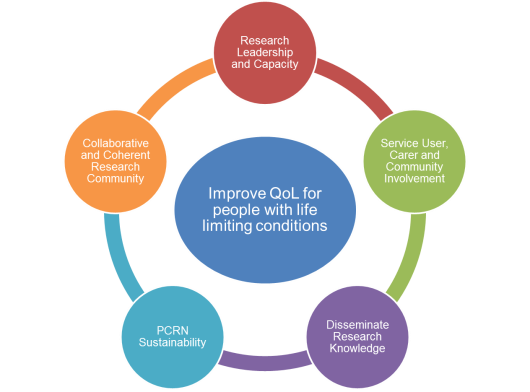 Measurement and Evaluation of Outcomes for Palliative Care (Research strand two): explores methodological development for palliative care research with a focus on measurement of needs, measurement of impact and evaluation of service priority and delivery. Watch this short video summarising this body of research by the lead principal investigator Professor Charles Normand, Edward Kennedy Professor of Health Policy and Management, Centre for Health Policy and Management, Trinity College Dublin. Eliciting Preferences for Complex Packages of Palliative Care – Extension of IARE study (International Access, Rights and Empowerment Programme). The Palliative Care Research Network Strategic Scientific Committee is responsible for supporting the strategic development of the Network. In collaboration with All Ireland Institute of Hospice and Palliative Care, the Committee supports the management of proposals for activities and programmes of work for the Network. The Committee’s membership includes representatives from academic institutions, hospices, members of the Voices4Care Research Panel (Voices4Care is AIIHPC’s service user, carer and interested citizen group and within this group there is a Research Panel subgroup) and health funding organisations across the island of Ireland. Prof Kevin Brazil, School of Nursing and Midwifery, Queens University Belfast. Professor Dympna Casey, School of Nursing and Midwifery, National University of Ireland, Galway. Prof Alice Coffey, Chair in Nursing & Midwifery, University of Limerick. Dr Michael Connolly, Assistant Professor, School of Nursing and Midwifery, University College Dublin. Dr Frank Doyle, Senior Lecturer in Psychology, RCSI, Dublin. Dr Lisa Graham-Wisener, Research Lead, Marie Curie Centre Belfast . Dr Suzanne Guerin, Associate Professor, School of Psychology, University College Dublin (Vice-Chair of PCRN). Dr Geralyn Hynes, Associate Professor, School of Nursing and Midwifery, University of Dublin Trinity College. Dr Bridget Johnston, Postdoctoral Research Fellow, University of Dublin Trinity College. Dr Gail Johnston, Programme Manager, HSC R & D Division, Public Health Agency, Belfast. Mr John Joyce, Voices4Care Member. Professor Sonja McIlfatrick, Head of School of Nursing, Ulster University. Professor Charles Normand, Centre for Health Policy and Management, University of Dublin Trinity. Dr Norma O'Leary, Consultant in Palliative Medicine, St James/Our Lady's Hospice, Dublin. Dr Martina O'Reilly, Head of Education, Research & Quality, Milford Care Centre, Limerick. Professor Sheila Payne, Chair in Hospice Studies, Director of the International Observatory on End of Life, United Kingdom. Professor Joanne Reid, Queen's University Belfast (Chair of PCRN). Professor Anthony Staines, Department of Nursing and Human Sciences, Dublin City University.